In 2009, Towns won the chairmanship of Oversight and Government Reform when the preceding chairman, Henry Waxman of California, moved to Energy and Commerce. Becoming Chairman of Oversight and Government Reform required Towns to relinquish his seat on Energy and Commerce. Towns led committee investigations of the Marine Corps MV-22 Osprey hybrid tilt-rotor aircraft, Secret Service procedures after a White House state dinner was crashed, and Toyota vehicle safety.16 When Republicans retook control of the House and Towns lost his chairmanship after the 2010 midterm elections, he was allowed to return to Energy and Commerce. 1Politics in America 2008 (Washington, D.C.: Congressional Quarterly, Inc., 2007): 701. 2“Biographical Directory of the U.S. Congress, 1774–Present,” http://bioguide.congress.gov; “Official Biography of Edolphus Towns,” http://www.house.gov/towns/bio.shtml (accessed 30 November 2007); Almanac of American Politics 2012 (Chicago: University of Chicago Press, 2011): 1142–1143; Politics in America 2012 (Washington, D.C.: CQ-Roll Call, Inc., 2011): 681–682; “AP Candidate Bios,” The Associated Press Political Service, 2000. 3“Biographical Directory of the U.S. Congress, 1774–Present,” http://bioguide.congress.gov; Almanac of American Politics 2012: 1142–1143; Politics in America 2012: 681–682. 5“Election Statistics, 1920 to Present,” http://history.house.gov/Institution/Election-Statistics/Election-Statistics/; Politics in America 1990: 1027. 6Politics in America 1994 (Washington, D.C.: CQ Press, 1993): 1050. 7Politics in America 2004 (Washington, D.C.: CQ Press, 2003): 701. 8“Election Statistics, 1920 to Present,” http://history.house.gov/Institution/Election-Statistics/Election-Statistics/. 9Contemporary Black Biography, 19, (Detroit: Gale Pub., 1998); Jonathan P. Hicks, “Expert Fund-Raiser Challenges Congressman,” 8 June 1998, New York Times: B10; Jonathan P. Hicks, “Relationship Begins to Warm Between Friends Turned Foes,” 30 January 1999, New York Times: B5; Almanac of American Politics 2000 (Washington, DC: National Journal, 1999): 1124–1125; Politics in America 2000 (Washington, D.C.: Congressional Quarterly, 1999): 934. 10Politics in America 1994: 1049. 11Politics in America 1998 (Washington, DC: CQ Press, 1997): 991. 12Government Operations underwent several subsequent name changes: becoming Government Reform in 1999 and Oversight and Government Reform in 2007. 13Garrison Nelson, ed., Committees in the U.S. Congress, 1947–2002, vol. 2 (Washington, D.C.: Congressional Quarterly, 1993): 887–888; Garrison Nelson and Charles Stewart III, Committees in the U.S. Congress, 1993–2010 (Washington, D.C.: CQ Press, 2011): 984–985; Congressional Directory, 112th Congress (Washington, D.C.: Government Printing Office, 2011): 491. 14Towns’s committee and subcommittee leadership can be found in the relevant Congressional Directories published during Towns’s tenure. See also, “Black Americans Who Have Chaired Subcommittees of Standing Committees in the U.S. House, 1885 to Present,” http://history.house.gov/Exhibitions-and-Publications/BAIC/Historical-Data/Black-American-Chairs-of-Subcommittees/. 15Politics in America 2008: 701. 16Almanac of American Politics 2012: 1142. 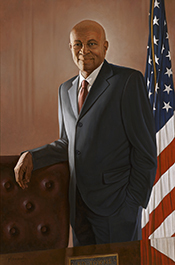 17“Official Biography of Edolphus Towns,” http://www.house.gov/towns/bio.shtml (accessed 30 November 2007); quote from Politics in America, 1992 (Washington, D.C.: Congressional Quarterly 1991): 1021. 18Robert P. Hey, “Education: Congress Pushes for Athlete Graduation Reports,” 5 June 1989, Christian Science Monitor: 7; Politics in America, 2006 (Washington, D.C.: CQ Press, 2005): 715. 19Politics in America 1994: 1049. 20Almanac of American Politics 1996 (Washington, DC: National Journal, 1995): 932; Politics in America 1996 (Washington, DC: CQ Press, 1995): 906. 21Politics in America 1998: 989. 22Politics in America 1996: 906. 24Politics in America 1998: 989. 25Aaron Blake and Ed O’Keefe, “Rep. Edolphus Towns, a New York Democrat, Won’t Seek Reelection,” 15 April 2012, Washington Post: np. Papers: In the Arthur Levitt Papers, 1948-2001, 26 linear feet. Correspondents include Edolphus Towns. Papers: In the Washington Office on Africa Records, Addendum B, ca. 1970-1996, 35 linear feet. Correspondents include Edolphus Towns. "Edolphus Towns" in Black Americans in Congress, 1870-2007. Prepared under the direction of the Committee on House Administration by the Office of History & Preservation, U.S. House of Representatives. Washington: Government Printing Office, 2008.